When I first started The Deletist, 150 postings ago, I had no idea what would happen or where it would take me. One day in May 2013, while setting up my business, I had a strong feeling that I needed a blog. Of course it could’ve just been the (ahem) beers talking, but I listened to my instincts and immediately switched tracks to get the blog going. Right from the beginning I established three house rules which have served me well. It’s a bit amazing to me I’ve managed to adhere to them for so long. For this week’s special posting, I thought it would be fun to highlight some of my favorites. The Deletist started with an innocent, exploratory posting on “Multi-step Deletions” wondering why we save so much and delete so little. It formed the foundation of my Deletion category. Another favorite is “A Tale of 19 Pillowcases.” While purging my linens one day I was baffled to discover I had an odd number of pillowcases and a large amount of them. Yet another gem is “Musings from an Organized Minimalist.” I’m definitely not a full minimalist yet, but I keep trying. And finally, my strong aversion to zombies continually inspires me to incorporate them into my annual Halloween postings: “Social Media & Zombies” (and “Social Media & Vampires“) and the four-part “Technombie” series. To commemorate 150 postings I did a few upgrades. Please use the new sharebar to share posts you like. Sign up to receive the weekly newsletter right from the sidebar. Check out the new Welcome! page. 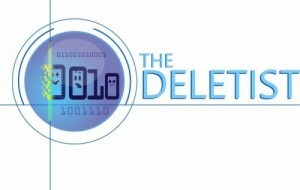 Coming soon, a Q&A section where you can ask The Deletist about your biggest purging challenges. Amazing, almost 3 years but seems like a much shorter time you gave been blogging. Love the blog for its insights and perspectives. Keep it going. Congratulations on 150! I’ve enjoyed reading them. Congrats on post number 150 my friend !!! Reading your posts has become a regular thing every week (ok, occasionally I get behind but I still enjoy getting a sneak peak on Tuesdays). I look forward to reading more fun and/or interesting and/or useful posts.